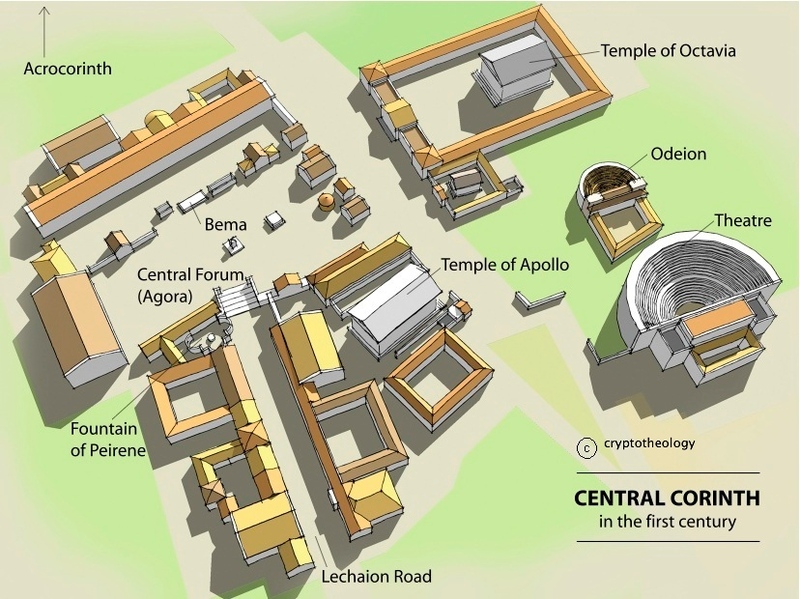 In Paul’s time, Corinth was the 2nd most important city in the Roman empire. Corinth was an exceptionally wealthy and important city in Greece. Corinth was the capital of Achaia and located 40 miles west of Athens on the narrow isthmus connecting Peloponnese (on the south) with northern mainland of Greece. 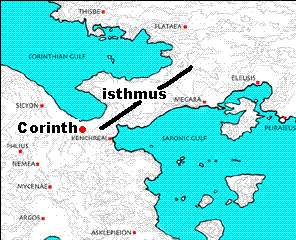 Corinth was located between the Aegean and Adriatic Seas and was a port city about five miles in circumference just south of the sharply rising 2000 foot Acrocorinth (see picture and see map “G”) from which Athens could be seen on a clear day. “Ships wanting to avoid the dangerous trip around the southern tip of Greece were dragged across that isthmus. The city boasted an outdoor theater that accommodated 20,000 people (See reconstruction of Corinth circa A D 100), athletic games second only to the Olympics, a Greek, Roman, and Oriental population….There were taverns on the south side of the marketplace, and many drinking vessels have been dug up from those liquor lockers. Corinth was noted for everything sinful.” (Charles Ryrie) Every shop in the city had a deep, spring-fed well in which to cool containers of wine. Strabo wrote that “All the people of Corinth gorge themselves.” It was even customary in stage plays for actors to come on stage drunk.